wen he hit da stage. at da East-West Center wit wun group. da nightclub club scene in Waikiki. on da Hawaiian neon wonderland. to mix his unusual beats. he got da dance floor cranking. dat wen give him his new stage name. and da crowd just loved him. even dough it’s really made of cow. is wun pretty good running back. just like he did in high school. foa somebody dat no like give any real effort. to make da intellectual cut. *manini – A kind of reef fish with vertical stripes; a slang term for something small or insignificant. and now da buggah is dead. so now we going make luau. cause we all get kulolo. just like wun big fish eye. and no even wondah why. heah in da hula-hula land. living in da verbal kine jazz. buggah – A person, especially a male; the word can also refer to an animal or thing. cho cho lips – Fat lips. holoholo – To go out; to go out visiting. hula-hula – Variant of hula, a native Hawaiian dance. jan ken po – Japanese name for rock-paper-scissors game. kaukau – To eat; food. kulolo – Hawaiian pudding made of taro, brown sugar and coconut milk. poho – No can; waste time. rat bite – A bad haircut that shows the scalp through the hair. 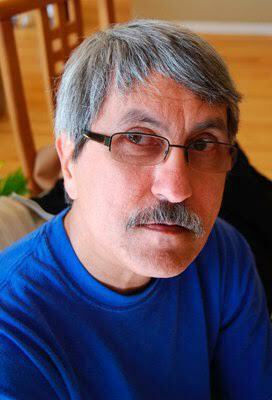 A bit about Joe: Joe Balaz writes in Hawaiian Islands Pidgin (Hawai’i Creole English) and in American-English. He has also created works in visual poetry and music poetry. Balaz is an avid supporter of Hawaiian Islands Pidgin writing in the expanding context of World Literature. He presently lives in Cleveland, Ohio.